So...I know this is cheating because technically this mochi isn't Trader Joe's brand, but if you're shopping at TJ's a lot, you need to try these, and I've never seen them anywhere other than Trader Joe's. For those of you unfamiliar with mochi ice cream, it's a sort of soft, dessert-ish, rice-based shell filled with ice cream, and, ohmyfreakinggosh, it's good. I guess Mikawaya is a Japanese company. It wouldn't surprise me if these puppies are imported from the Orient. They're a little pricey: in the ballpark of $3 for six little ice cream ball things...but trust me, it's worth it. If you buy them individually at a mochi ice cream restaurant in Little Tokyo, for example, you might pay $1 for each one. So six for $3 is a bargain. Plus, the quality is on par with ones I've had from an actual mochi parlor. They're amazing. My favorite flavors are strawberry and vanilla. Chocolate is OK...only get the green tea flavor if you LOVE green tea. I've never had mango, but I hear it's not bad. Next time you're in the frozen section of TJ's, pick up a box. They're scrump-dilly-icious. Bottom line: 9.5 out of 10. Update: Mango is indeed not bad. It's right under strawberry and vanilla in the flavor rankings. Just so you know, Mikawaya is a Los Angeles company and they have a shop in Little Tokyo where you can get all kinds of new flavors. Yummylish! They actually have a factory in Little Tokyo near the Mikawaya store, which is where they probably make all of them. The mochi with gelato is the best imo. It's a must try if you're in Little Tokyo. The mango is great, and the green tea is pungent (but great). I love the green tea and mango ones. I find that I am just not interested in such pedestrian flavors as chocolate, vanilla, and strawberry (perfectly fine flavors though they are) with such an exotic frozen treat! It seems to me the key with these, which I've also had at Japanese restaurants, is to eat them at just the right halfway point in between rock-solid frozen and squishy-melty. Mmmmm, so good! I wish they made match green ice cream. That would be a delicious treat. I don't think so. I used to like the Mochi from Makawaya but will never buy from them again. The maker doesn't care about quality control and you could easily get sick if you got a bad batch. Calls to advise them via email or phone are unanswered. I guess as long as no one sues them, they don't care. 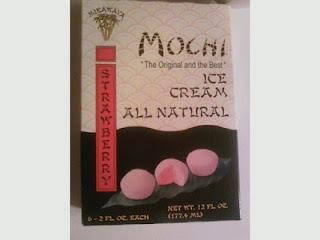 You can find Mochi Ice Cream at all oriental grocery stores. They carry the Mikawaya brand as well as others. I have seen coffee and red bean flavour too. PLEASE tell me they are gluten free???? They are not :( I found out the hard way. I have celiacs and have bought other mochi ice cream brands and they were always gluten free, so I didn't think to check when I bought this brand. They are coated in wheat flour and I got very sick! Shame because they're good. I suggest Mr. Mochi brand, they are all gluten free and I found them at Food Lion. Better quality mochi than this brand as well.